If you've followed me for any length of time, or even if this is your first time here, my love for Appalachia is obvious. I mean, it's right there in the name of the blog: Appalachian Mountain Roots. I do have other interests but they usually end up taking a backseat to family, homeschooling my son, and finding and writing about Appalachian related things that I find interesting. Luckily for me, I can incorporate this "hobby" into other aspects of my life. My husband likes history, so we can enjoy talking about the things I discover...either that or he's good at faking it. Bless him. I can incorporate the local history and traditions into our homeschool day. My son is learning more about the area that he calls home as I research different subjects. Win-win, right? I love to read and I have always been drawn to books that are centered around Appalachia. Another score! I also love learning as much I can about my family and the people who have helped make me who I am. That interest in genealogy led me on a 5 hour online journey last week that left me excited, proud, and a little cross-eyed. Five hours is a long time to stare at nothing but a computer screen, folks. So, the journey began when I pulled up my online family tree, that I've been working on for what seems like forever, to find a name. While there, I noticed that I didn't have as much information as I thought I did on my mom's paternal side and apparently that's all it took for me to fall down the rabbit hole. 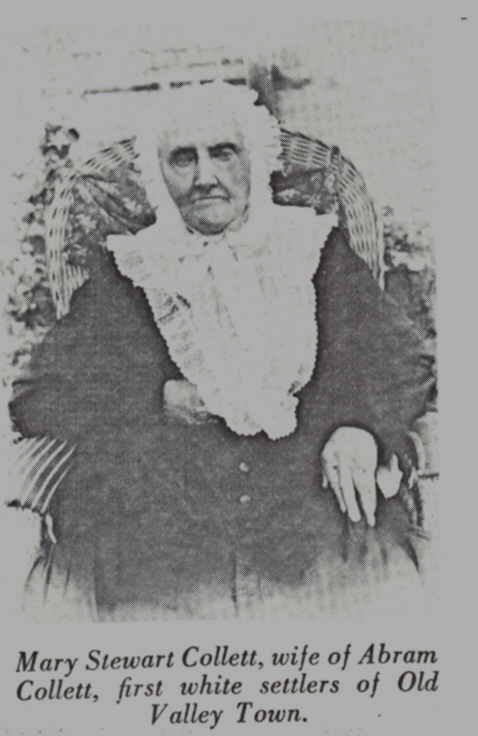 Five hours later, I discovered that a man and woman, whom I knew a little about, were not my great (x 5) aunt and uncle but my great (x 5) grandparents. One mistaken middle initial can throw a whole branch of your family tree off! I also learned a lot more about them. 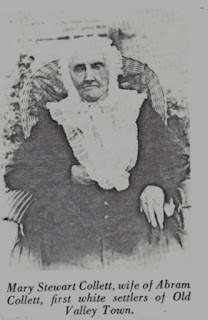 Abraham (Abram) and Mary Polly Stewart Collett were the first white settlers of Old Valleytown (1830), a section of what is now Andrews in Cherokee County, NC. These two people were my great (x 5) grandparents. They are buried in a small family cemetery that I have visited and is just a short distance from where my great grandparents (Hub and Hazel Collett) lived. As a kid, I didn't think anything about the history that was all around me. Now, it means a lot. It took me nearly 38 years to discover that I'm the 8th generation (on that side) to live in Cherokee County, NC and my son is the 9th. That's an incredible length of time for a family to be in the same county. We've been in the Appalachian region of NC for even longer than that. I had no idea of just how deep my roots were. What an excellent, unexpected discovery.